Nour Tradition brushes are made of 100% Dupont Poly/Nylon filaments The filaments are processed to perform with resilience and enduring precision. Excellent quality for all of your painting tasks. The 2.5 inch (63mm) Angled Tradition paint brush is a professional polyester/nylon brush for use with all paints for both interior and exterior painting. This angular brush size is best suited for medium to larger-sized jobs such as walls, doors, crown mouldings, cupboards, and larger furniture. We only use the highest quality filaments which makes this brush extremely durable and effective for precise edging. 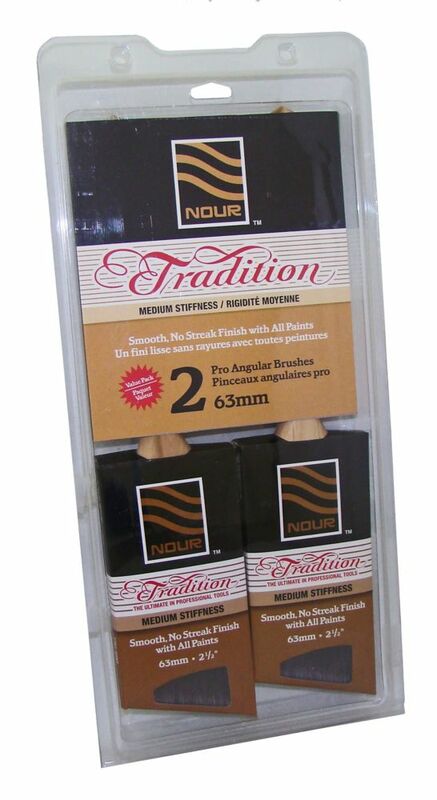 Nour Tradition 63mm Brush 2-Pack Nour Tradition brushes are made of 100% Dupont Poly/Nylon filaments The filaments are processed to perform with resilience and enduring precision. Excellent quality for all of your painting tasks.